Need help with critically evaluating others art work or contrasting and comparing, here are a few examples from my Distiction level Art history project. The lines in this image are broken up and curved to show an impression of an image that borderlines on unreal. Even though the lines are broken up they guide the eye around the painting. Thick lines have been used to add detail to the houses in the lower part of the image. The use of curves and swirls that flow along the top contrast against the unbroken lines in the lower half of the image to achieve balance.The artist has used contrasting orange and blue tones that accentuate detail and light in parts of the image such as the brightness of the moon. The artist was known to paint quickly and the quick dash-like brushstrokes implies texture especially in the lower half for the fields and the trees. There is a light colored section in the middle that runs the length of the image that brings the higher more rough looking style and the lower more detailed space together. 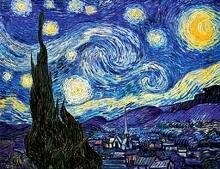 I am not a big fan of Vincent Van Gogh's work as I find his technique a little “busy” for my taste, however, I am interested in the psychology behind this painting. I have included this quote because I think it is relevant to the above image, not only because he speaks of painting the stars which he has obviously done, but because he speaks of his “terrible need” for religion and I think that some of the images in the above painting are quite church-like. Whether or not he has done this deliberately is anyone's guess, but I think he may have done this subconsciously. He was known to paint very quickly and have an undying urge to paint and maybe the thoughts from his subconscious mind, as well as whatever mixed emotions he was experiencing at the time, were released through his creativity. I also noticed that the church-like image from the previous painting were really reeds. I find it odd that they would differ so much as everything else in this image is very similar to the images in the painting. I also noted that this picture was done after the painting. Maybe the artist was in a different frame of mind when he did the latter. This leads me to believe that there was a spiritual meaning behind this painting. 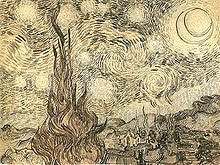 Van Gogh also used flame like brushstrokes for the church-like image which could represent a burning desire for religion also.